signed and on verso signed, titled Jeune canadienne grecque, rue Jeanne-Manse [sic], Montreal, dated 1975 and inscribed "75-172"
After studying at the Montreal Museum of Fine Arts’ school, John Little began working as a draughtsman at his father's architectural firm in 1951. When he began painting cityscapes in 1953, his works reflected his interest in Montreal's distinctive buildings and urban neighbourhoods. The city was adversely affected by urban planners of the 1960s, so his work is a valuable record of the uniqueness that was lost. Little's distillation of the atmosphere of winter in Montreal is highly refined and utterly distinctive. He captures the unique greyish-white light of an overcast day, and his painterly depiction of snow is adept. He showed it collecting in soft clumps on pots, caught in the crook of a tree and creased with footprints on the sidewalk - portrayed with strokes and scribbles of green-grey on the white. 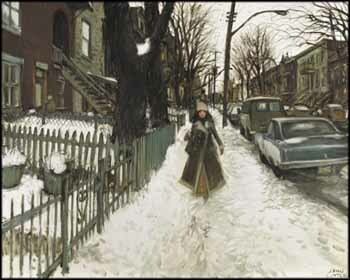 Some of Little's most sought-after works are of the stylish, cosmopolitan women of Montreal, such as this lovely young woman stepping jauntily down the street in her fashionable winter outfit. The contrast between her youthful modernity and the historic neighbourhood around her is particularly delightful.